Alex is from Little Rock and we first met him last September on a fly fishing trip to Montana. Then this past January Alex joined us on our big fly fishing adventure to the Patagonia Region of Chile. 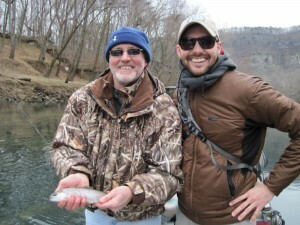 Last Saturday Alex brought his Dad to the Little Red River for his first ever fly fishing trip. Bo always enjoys a father-son fly fishing trip because he has so many great memories of fishing trips with his Father. Now Bo is making new memories with his son, Trent, on as many fly fishing trips as they can possibly make together. Anyway, Alex’s Father, Dennis, quickly picked up on the casting aspect of fly fishing but it took missing about a half a dozen fish before Dennis got the hang of the hook set. 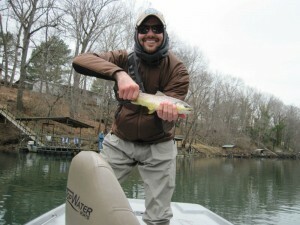 Once he got firmly hooked up to his first Rainbow he was on track for a very successful first day of fly fishing. Dennis is now our third first time fly fisher this year to catch their first fish on a fly! Honestly, this turned out to be a one fly day. Really, they guys fished all day with just a #14 gray flash back Sowbug. I think the water is so cold right now that there are not any insect hatches so sowbugs are currently the stale of the Trout’s diet. We grilled up some good Arkansas chicken on the river bank for lunch and I think you can tell from the smiles that this father-son had a special day of fly fishing together!